If you haven’t yet seen the film that finally got Leo his Oscar, now’s your chance. 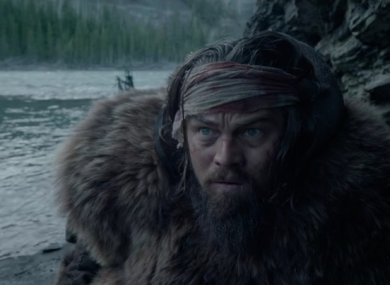 To sum it up, Leo plays a frontiersman who gets mauled by a bear while leading a hunting party though a remote, wild landscape. When his companion leaves him for dead and kills his son, he sets off for revenge. Dublin take on Donegal. Throw in is at 7pm. You know you wanna watch this instead of England v Belgium. So there’s no new show tonight, as it’s Saturday. BOO. However, you can catch up on all the little things you missed this week in the highlights show, plus some added extras. Why would you ever go out, at all? The spooky Netflix reboot is something we’re all excited for. Now, we have some new teasers and OH MY GOD RELEASE IT ALREADY. Begin Again (RTE 2, 11.55pm) Twee movie about a musician and a record producer looking for inspiration. Night at the Museum, Secret of the Tomb (RTE 1, 7.10pm) If you’ve ever dreamed of staying over in a museum and watching the exhibits come alive, this is for you. The Voice Kids (TV 3, 8pm) Look, I don’t endorse this, but if talent shows are your thing. Mississippi Grind (BBC 2, 10.15pm) Ryan Reynolds stars in this movie about two gamblers who embark on a gambling binge in various casinos. Star Trek, Into Darkness (Channel 4, 8pm) All together now, NERD. Email “What to watch on TV tonight: Saturday”. Feedback on “What to watch on TV tonight: Saturday”.